French rooster standing, holding sceptre, 1836 underneath / Tamil inscriptions. Pondicherry mint. Nice thick chunky coin, 17mm, 3.98 grams. KM-52.Very nice for these. The French set up base along with the British in the 17th century. They occupied large parts of southern India. However subsequent wars with the British, led to the loss of almost all their territory. They however retained the colonies of Pondicherry -(Pondicherry, Karaikal, Yanam, and Mahé.) and Chandernagore. Pondicherry was ceded to India in 1950. France is a nation that has long been known for its passion for fine arts. It should come as no surprise that once France decided to issue coins, it took that same passion to designing them. The 20 franc Rooster is a gold bullion investment that many collectors admire not just for its value, but the fact that it is in itself a piece of art of considerable rarity. For those investing in gold today, having this type of collectible coin in their portfolio means having a piece of history, too. These gorgeous gold bullion coins were minted first between 1898 and 1914, becoming a big hit right off the bat. Those gold coins which have survived from 1898 are considered particularly valuable by many collectors, but even after 1914, the Roosters continued to be produced in limited runs. Some were minted again in France’s capital of Paris during 1921 and a brief run was also produced between 1951 and 1960. All of these have value to those investing in gold, but collectors approach their value differently depending upon the condition of each. The general design of these coins is easy to recognize. On the front, they show Lady Liberty, the symbolic face of the Third Republic of France that ruled over the nation between 1870 until World War II. Around the head of Lady Liberty are the words Republique Francais in all capital letters. France has seen two more Republics since that time, being in the Fifth Republic today. On the back side of the coin, we see the image from which the coin derives its popular name among today’s gold bullion coin collectors. The Gallic Rooster, an important symbol of France and the French people, is seen in all of its plumed glory. The bird appears to be strutting with its head thrown back, indicating a fighting stance that conveys a sense of independence and dominance over its territory. This is to represent not just the pride of French culture, but also the fighting spirit of those who brought the French Revolution about and the positive changes it made. The image of a rooster is one that ties back into the medieval heraldic symbols of France and the capitalized words that surround it – Liberte, Egalite, Fraternite – meaning Liberty, Equality and Brotherhood. Those 3 powerful words were the motto for the victorious side of the French Revolution. One reason that these impressive coins are such a good bargain for collectors today is that they are rarely going to be more expensive than the price of gold at any given time. This makes them a sound choice for those investing in gold; since they are truly scarce their value is bound to climb with the passage of time. These coins continue to be guaranteed by the French government and are recognized in many other parts of the world as legal tender, too. When you combine this with the fact that they contain close to one fifth of an ounce of gold, it is easy to understand how these coins have managed to entrance collectors for over a century. 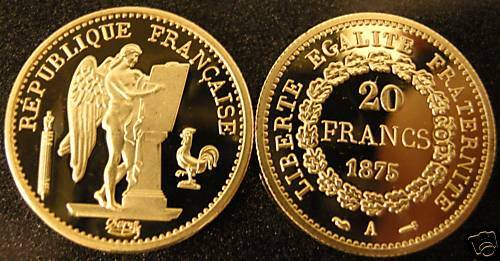 Those who want a beautiful and historic gold coin that is truly a treasure to own, should consider the 20 franc Gold Rooster of France. It is a legendary coin with a lot to offer anyone that appreciates gold, art, French culture or world history. 0.1867 troy ounces (5.81 grammes) of fine gold. The photograph shown here is of a 1910 20 Franc coin. 0.0934 troy ounces (2.90 grammes) of fine gold. The photograph shown here is of a 1907 10 Franc coin. The photograph shown here is of a 1954 10 Franc coin. The photograph shown here is of a 50 Franc coin and others. French 20 Francs have two popular designs with colorful histories that are available today. The Rooster, and what is often called the “Lucky” Angel. Like the Swiss Franc, each coin contains .1867 troy ounces of pure gold. These coins are popular for their size and are Legal Tender coins. The French Rooster In the Middle Ages was widely used as a religious symbol, the sign of hope and faith. It was during the Renaissance that the rooster began to be associated with the emerging French nation. Under the Valois and the Bourbon kings, the royal effigy was often accompanied by this animal, meant to stand for France, in engravings and on French gold coins. The Revolution established the rooster as the representation of the Nation’s identity. It featured on theecu Gold French Coin, sporting the Phrygian bonnet, on the seal of the Premier Consul, and the allegorical figure Fraternity often carried a staff surmounted by a rooster. The Trois Glorieuses of 1830 and the Duke of Orleans signed an order providing that the French rooster should appear on the flags and uniform buttons of the National Guard. The seal of the Second Republic shows Liberty holding a tiller adorned with a rooster. Under the Third Republic, the wrought-iron gates of the Elysie acquired a rooster, the “Rooster gate”, which can still be visited. During the First World War, rising patriotic feeling made the Gallic French rooster the symbol of France’s resistance and bravery in the face of the Prussian eagle. Use of this Manichean representation, in particular by political cartoonists, gained ground, and the rooster became the symbol of a France sprung from peasant origins to become a proud people and gain world recognition as it own nation with global trade recognition and one of the most recognized European gold coins known as the French gold rooster. Angels were minted from 1871 to 1898. Almost from the beginning, gold Angels were regarded as lucky. Their legend began during the Reign of Terror in the mid-1790s, when the coin’s designer, AugustusDupré, claimed to have been saved from the guillotine by the lucky Angel coin in his pocket. According to legend, Dupré said a quick prayer as he knelt beneath the deadly blade. Suddenly, a bolt of lightning struck nearby, igniting a panic that halted his execution. Within six months Dupré was a free man, believing forever after that he was saved from certain death by the protective powers of his guardian gold Angel. By the mid-19th century, the Angel’s reputation for good luck was firmly entrenched. Captains seldom went to sea without one. French pilots inWorld War I rarely took flight without a gold Angel coin in their kit, believing it would protect them from the Red Baron and his aces. During World War II, the chief of Hitler’s Luftwaffe, Hermann Goering, became obsessed with these French angel coins. Confiscating all he could find, he presented them to ace German fighter pilots as rewards for every fifth Allied plane shot down. French Gold Coin 20 Franc Rooster Francs Coins are collected with a passion by collectors and gold investors worldwide. One of the most important reasons for the popularity of the French Gold Franc is their unique designs, affordable prices and most importantly high gold content. Non-Reportable gold coins were officially minted in France in the year 1901. They were officially known as the French Roosters. Very fine gold is contained in every single Gold French Coin that is guaranteed by the government. Every French 20 Franc gold coin is offered to collectors as exquisite, mint condition pieces. TheseFranc French coins are legal tender that are trusted and genuine. They were minted from the year 1901 to 1914. These French gold coins are on offer today as private and non reportable both when you buy as well as when you sell them. French Rooster Gold Coins are beautiful and attractive and come in the most fascinating classic structure and design. The Revolution established the rooster as the representation of the Nation’s identity. It featured on the ecu Gold French Coin, sporting the Phrygian bonnet, on the seal of the Premier Consul, and the allegorical figure Fraternity often carried a staff surmounted by a rooster. The French 20 exemplary design is that of the third Republic lady head surrounded by the French Revolution motto Republique Franaise facing front. This Lady Liberty was created in the year 1870 when Napoleon III was defeated in the Franco-Prussian war. The other side of this unique French Coin Franc contains a plumed rooster. Words etched in capital letters around the edges include Liberte, Egalite, Fraternite. This is the phrase coined against Louis XVI during the French Revolution. TheFrench Franc Coin measures 21.0 mm in diameter. The exclusive Gold Coin French Franc is made of an ounce of gold. Fineness of the gold is 0.900, which is about 90% pure gold equating to twenty or twenty-two carat. It is extremely rare to find gold coins French francs dated before 1901 and these are in huge demand from passionate coin collectors. Every gold coins collector and gold investor interested in the deep cultural history of France strives hard to locate and collect these rare coins. This French Franc Coin come with a face value of 20 French Francs. This is surprising as the value of gold is considerable. Even though these coins are rare collections, they are offered at affordable rates as they are one of the most popular world gold coins produced in Europe. They belong to a small class of globally recognized currencies which also includes the sovereign gold coins and the swiss gold franc. The Gold Rooster collectors covet the French Francs dating back to the nineteenth century. These rare coins are the essence of the country’s rich heritage and can be found in the most stunning designs. Each one of these magnificent French Coin Franc pieces are a masterpiece in exclusive French design and art. If you are a coin collector or an investor, French gold coins should be a part of your collection. It is considered a smart investment to purchase these affordable coins that come with a strong guarantee from the government. Add in some precious and valuable French Rooster gold coins to your coin collection.